Home » Health » What Is Ascariasis? Ascariasis is an infection caused by roundworms. This worm is a type of parasite that can live and multiply in the human intestine. This worm-induced infection usually does not cause specific symptoms. However, the large number of roundworms in the intestine can potentially trigger serious symptoms and complications. If there are symptoms that appear, there are two phases of indications that are usually experienced by people with ascariasis, the early and advanced phases. In the early phase of infection, the eggs of the swallowed worms will hatch, triggering symptoms such as fever, dry cough, shortness of breath, and wheezing. This phase can generally last up to 21 days. In the later phase, larvae have migrated to the intestine and develop into adult worms. Mild to moderate ascariasis will lead to symptoms of abdominal pain, nausea, vomiting, diarrhea, or the appearance of blood in the stool. The presence of worms in vomit or stool. Check with your doctor if you experience any of these symptoms for immediate treatment. Ascariasis can occur when you swallow the roundworm eggs present in water or food. 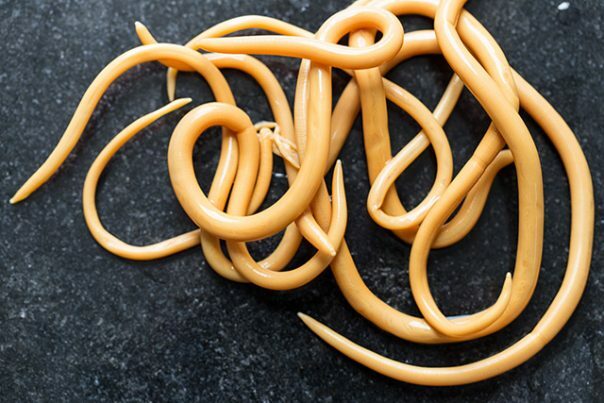 Foods grown on soil contaminated with roundworm eggs can also be a source of ascariasis. Cleanliness is not maintained . Ascariasis is much developed in places that are less clean, especially areas that use human feces as fertilizer. Age . Ascariasis generally affects patients aged 10 and under. Population density . These infections often occur in areas with high population densities. In addition to asking for symptoms and medical history of the patient, the doctor will take and examine the stool sample of the person. This procedure will help the doctor to check whether or not there is worm eggs in the stool. Blood tests can be performed to see any rise in certain white blood cells called eosinophilia , but this is not specific to ascertain Ascaris infection. Advanced examination using X-rays , ultrasound or CT scans and MRI to see if there are larvae in the lungs, adult worms in the liver or pancreas, clumps of worms that clog the liver or pancreas. Mebendazole . This drug is recommended for patients aged 1 year and over. Potential side effects include diarrhea, skin rashes, and frequent bladders. Piperazine . Infants aged 3 to 11 months are usually advised to take this drug as much as 1 times only. Abdominal pain, diarrhea, nausea, vomiting, and colic are some of the side effects of piperazine. Albendazole . These drugs are usually recommended to be consumed 2 times a day. Abdominal pain, nausea, vomiting, dizziness, and skin rash are some of the side effects patients may experience after taking albendazole. Always wash hands with clean water and soap, for example before eating, cooking, or after bowel movements. Make sure the dishes are really cooked before eating them. Drink water in sealed packaging when traveling. If not available, cook water until boiling before drinking. Consumption of fruits that can be peeled, such as oranges or apples. Wash fruits and vegetables thoroughly before consumption. 0 Response to "What Is Ascariasis?"